The Super Daiseikai is a champion in energy saving. A 6 star energy rating on heating and cooling and 5.1 energy efficiency rating (size 10) means that it saves 35% more than a standard 6 star inverter. Thanks to its twin rotary compressor, it can operate at very low speeds (minimum cooling capacity is 0.5 kW), consuming only 100 Watts. This system combines both savings and efficiency. 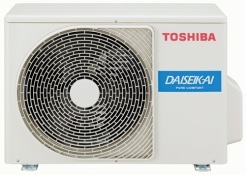 It can operate at any outside temperature, from –15 °C in heating mode to –10 °C in cooling mode.